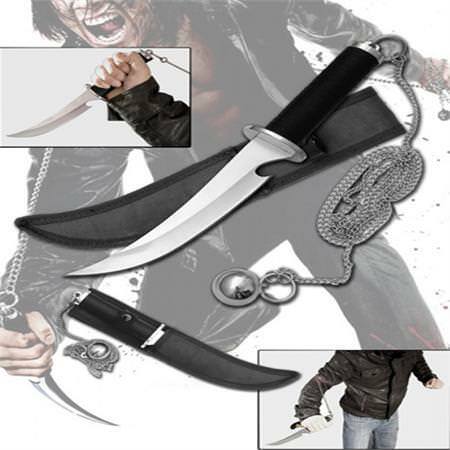 This is the knife which can be seen in the hit movie Ninja Assassin which was use by the infamous Ninja Raizo (Rain), one of the deadliest assassins in the world. You can own this very piece Kyoketshu-Shogei knife; its a knife with a chain hook on the handle. The Ninja Assassin Kyoketshu-Shogei knife features a 3mm thick, stainless steel blade with a gut hook at the end of the blade which is then followed by a solid oval metal guard and a black nylon cord wrap handle. There is a long metal chain which is attached at the pommel of the knife and has a ring at the end. The chain could be used for clinging and ensnaring an enemy, binding an enemy and many such other uses. The long range of the weapon combined a cutting tool with the capability to strike or entangle an enemy at what he perceived to be a 'safe' distance out of the way. It can also be used to disarm an opponent with a sword. The length of the chain and ball is about 53 inches. 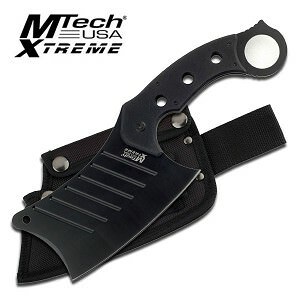 This Ninja Assassin Knife comes equipped with a black nylon pouch with belt loop for easy carrying and a snap clip for safety.